This carbon footprint calculator is composed of 50 questions in four main areas: transportation, home energy, food and personal purchases. The calculator includes location-specific calibrations for energy sources, agricultural practices and climatic conditions across the globe. After measuring their carbon footprint, students join an online discussion forum where they discuss their emissions, envision solutions to decrease them and share knowledge with students from around the world (so far 35 countries involved). 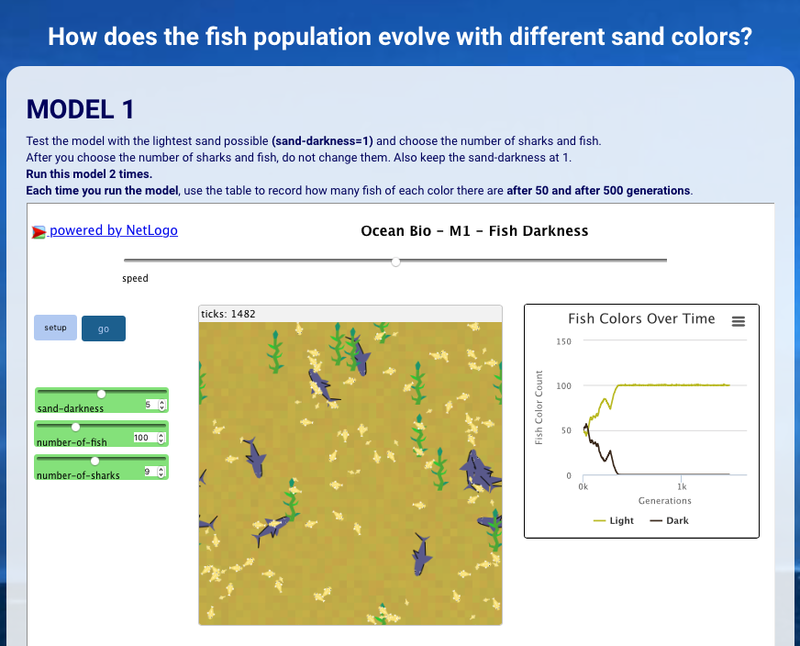 This learning unit addresses the current marine biodiversity crisis through interactive simulations. The science content goals (e.g. natural selection) are addressed by engaging students in meaningful collaboration. The “Loss of Ocean Biodiversity” curriculum was implemented as a WISE unit that addresses: (1) the mechanisms of evolution through marine examples, (2) the current loss of biodiversity (brought to light through the concept of evolution) in the marine environment, and (3) how this decrease in biodiversity has negative consequences for the wellbeing of humans. In this activity, the user plays the role of a PhD student studying climate change and the impact of ocean acidification on mussel populations. They read the literature about these issues and the biology of blue mussels and some of their predators (e.g., sea stars), then come up with their own hypothesis concerning how temperature and acidification might have a direct and indirect impact on blue mussel populations. They apply for funding by sending a proposal to their teachers, and when successful, design their own experiment to conduct further research. The virtual laboratory introduces students to the issue of ocean acidification (OA). This tool is divided in three parts. First, the students navigate through an interactive slideshow presenting the OA background information. Second, the students run a virtual experiment aiming at finding out how OA affects sea urchin larvae development. Third, the students measure a virtual sample of the larvae they grew to calculate the average arm length of the larvae.